Rainbow of Surfboards for Winston! 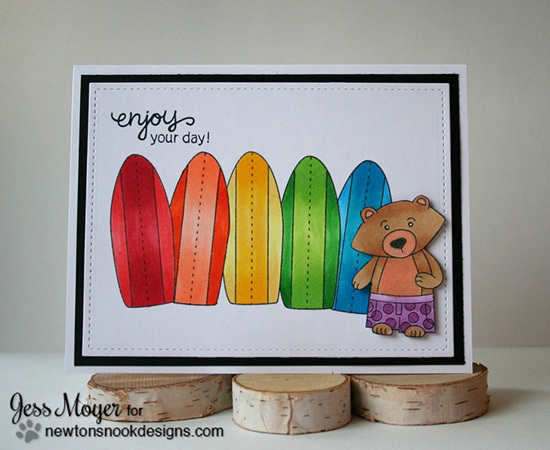 Today I'm sharing a fantastic rainbow card by Jess Moyer! Jess used the surfboard from the Beach Party stamp set and colored it in a bunch of rainbow colors. Which one will Winston (our bear) choose to go surfing with? She also used the "enjoy your day" sentiment from the Newton's Summer Vacation stamp set. Love those rainbow surfboards! Fun card. Aww, what a great card!!!! I am loving those rainbow surf boards!!! Looks like Winston is ready for some serious summer fun! Those colorful surf boards make for such a fun, festive card!